We had some nice KC-DBA (expertise meetings) meetings in 2005. One of them was about virtual machines (VMware basically). To show how you could use virtual machine technology to implement an environment which would be almost undoable nowadays to realize, a virtual machine environment was demonstrated with Oracle 4.1 installed based on DOS. 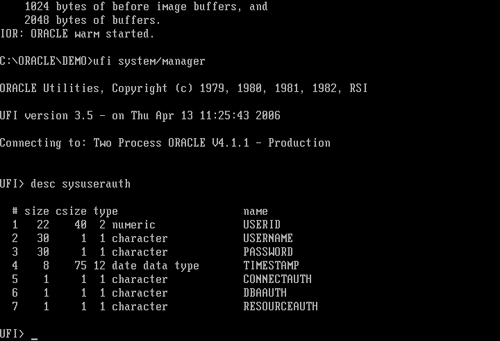 Thanks to Carel Jan Engel (one the infamous OAKTable guys) – i was able to build a default Oracle 4.1 database environment with all the goodies like the UFI (the user friendly interface). Strange enough you need(ed) the first oracle floppy in the floppy disk to start the database. I can not remember this from my Oracle 6 days. 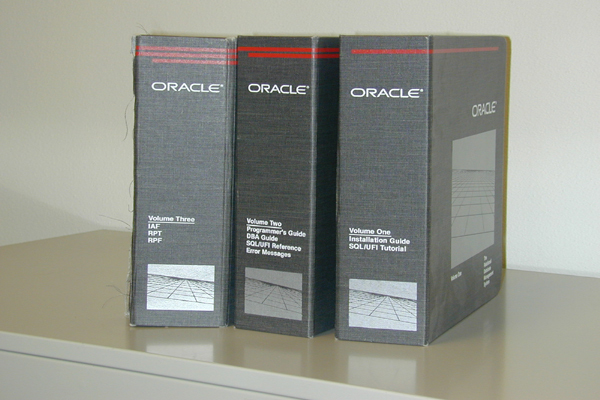 Is there anyone who still has the Oracle 4.1 documentation? If so please send it so i could add it to this post for sharing purposes. If you want me to test some stuff on the Oracle 4.1 environment then please send me your SQL statements. The software does not understand the create database link statement, but maybe thats not the correct statement. 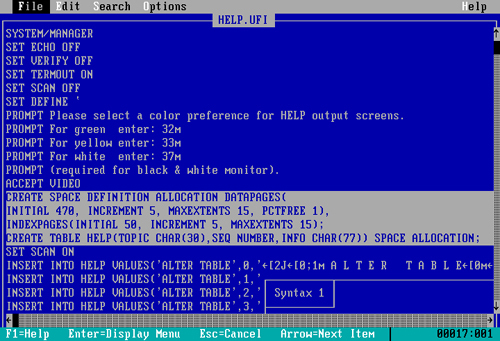 I also installed the “help” function, or enabled the help function by filling the “help” table but there is no reference (as far as i could find) to “database link”. In Oracle 4.1 there isn’t a “system.users” table yet. The connectauth, dbaauth, resourceauth columns reference, if the user was granted the connect, resource or dba role (small guess). You could also read the complete documentation over the weekend! Very nice. Got the image working. When I start Oracle.EXE mem.exe (or mem/c) reveals Oracle is indeed running. But how do I connect to it with UFI? It keeps complaining that it can not find the SGA (osdlsg: SGA file not opened). I have updated (the postscriptum) the blog, so this should help you on your way. As said if there is someone with some documentation then it would be great if you would send it to me, so i can post it here. 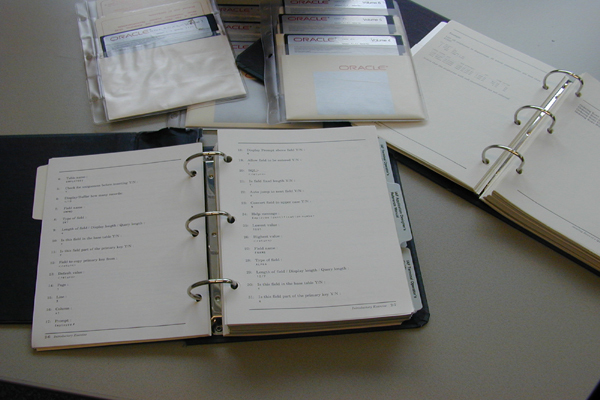 the three booklets that came with the floppies. Of course, how could I forget: IOR W. Man, that’s a long time ago. Too bad I threw away these grey boxes 2 years ago, since, yes, I did have Oracle 4.1. A few things I found out. 15 years with Oracle, but started with V6. * Connect floppy drive by double-clicking on the floppy icon in the VM’s bottom status bar and activating ‘Connected’. o Do not choose “Connect at power on”, since the system would then try to boot from floppy at next boot. o Cannot read command file “” can be ignored. I googled for “login.ufi”, but there is no documentation to be had. o Just runs without stopping, despite me setting “set pause [enter]” – any idea? * To reboot the system, disconnect the Floppy-Disk first. 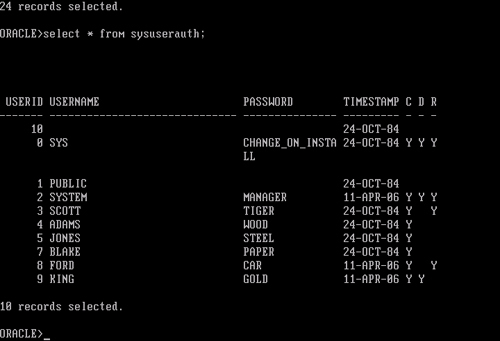 The login.ufi is the same as nowadays login.sql. It’s in the demo directory. If you CD \ORACLE\DEMO first and then start UFI, you won’t get the warningmessage. Is it true that subqueries were a new feature in Oracle 5? It’s be nice to see a screenshot of one not being recognised in v4. I’d also be interested if anyone could resurrect a v6 database or Forms 3 and see whether the mythical Implicit Cursor Second Fetch thing ever had any truth in it. This blog entry has changed its contents on kind request by Ken Jacobs. 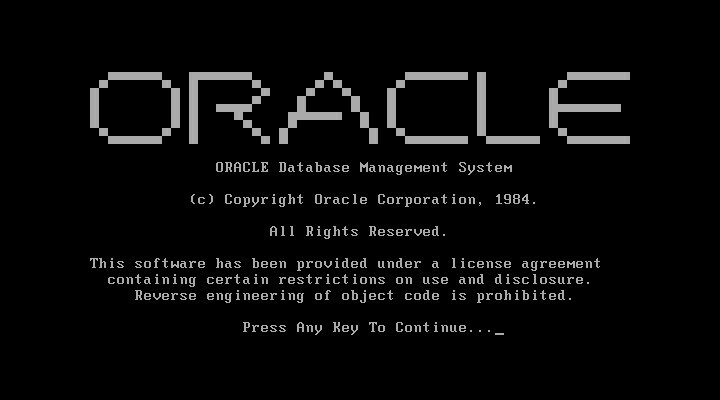 The reason is that it would endanger a project, that i as oracle database enthousiast, would never ever would or want to jeopardize. your experiences, but not the software itself. 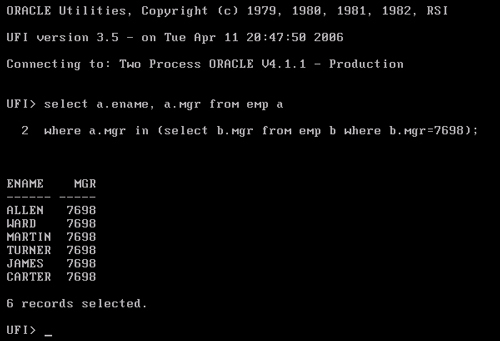 By the way, subqueries were implemented in Version 2 (1981) of Oracle. The correlated subquery format came later. Also mentioned as new features in Version 5 are database links and encrypted passwords. It might be interesting to query SYSTEM.USERS. The original article (was posted on the AMIS Technology company website (see here: http://technology.amis.nl/blog/?p=1127). Because the site was once hacked and due to the use of multiple plug-ins, the content was scrambled over the years. To preserve the initial content; it is now posted here on my own site. Do you have a 16 bit sql*net software, that works with ORACLE5 ? If you do please send the zip file to the above e-mail address. I have the sql*net driver SQLTCPF.EXE, but I do not have the rest. Sorry can’t share Oracle software you will have to obtain it some other way.